Last week, Stephen Colbert confirmed the entire slate of guests scheduled to appear on his first week of The Late Show on CBS, and it was a thrilling list that combined big names (George Clooney! Amy Schumer! Maybe Pavement!) with lesser-known up-and-comers (The CEO of Uber! The CEO of Tesla! Presidential candidate/teen heartthrob Jeb Bush!). For his second week, Colbert will be taking a similar approach, although the presidential candidate will be of a much higher profile, and the celebrities will all be a little less famous than George Clooney. On Monday, September 14, he’ll have Emily Blunt, Justice Stephen Breyer, and a musical performance by The Dead Weather. On Tuesday, he’ll have Jake Gyllenhaal and a musical team-up of Run The Jewels with TV On The Radio. Wednesday will be a busy show, with Kevin Spacey, a comedic team-up of Carol Burnett and Abbi Jacobson and Illana Galzer of Broad City, and a musical performance from Willie Nelson. Thursday will have Naomi Watts and, in what is probably a huge get that Jimmy Fallon is pissed about, United Nations Secretary-General Ban Ki-Moon. Finally, on Friday, September 18, Colbert will have Lupita Nyong’o, hotshot underdog Presidential candidate Bernie Sanders, and a performance from the cast of Broadway’s An American In Paris. 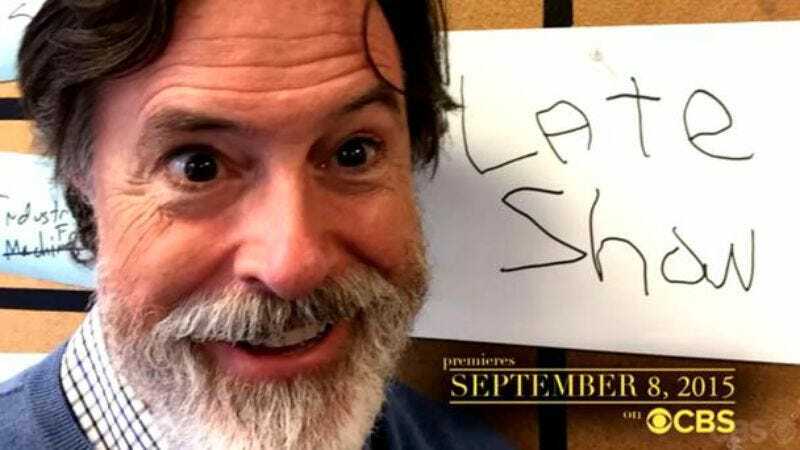 Colbert’s Late Show will premiere on September 8 on CBS.